Fed up with feeling frazzled in the AM? The path to morning mindfulness may be easier than you think. Let BBC Radio 3’s Breakfast team transform your day with some simple tips and tunes. If you wake to an artificial alarm, you’ll know how unbelievably tempting it is to hit the snooze button for a few extra minutes of Zs. But there’s evidence to suggest that dozing past your wake-up time can do more harm than good. If you drift off to sleep soon after waking, your body can take this as a signal to begin the whole sleep cycle again. Snoozing also extends that initial period of grogginess (known technically as “sleep inertia”), where your body isn’t sure whether you’re waking up or not. That muzzy feeling should dissipate within minutes if you get up straight away, but can last for up to four hours with repeated jabs to the snooze button. As if that wasn’t enough, being woken by an artificial alarm causes spikes in blood pressure and heart rate that are exacerbated when you’re jolted awake again and again and again. So, painful as it may feel, you really are better off getting up first time round. This is a simple way to reconnect your mind with your body after the two have spent some time apart overnight. Lying still on your back in bed, allow your consciousness to dwell on every part of your body in sequence. Imagine that you’re trying to feel your body from the inside, from head to toe, using only your mind. Once you’ve focused on every part of the body in turn, gently wiggle your fingers and toes before starting to rotate your wrists and ankles. Slowly move onto your side and rest there a moment before rising into a seated position with your feet firmly planted on the floor. The usual advice is to drink around two litres (or six to eight glasses) of liquid every day. But starting the day with a glass of water isn’t just a way to rehydrate your body after a night of fasting, or to get rid of morning breath – it’s an opportunity to engage in some mindful thinking too. As you drink, be aware of all the sensations you encounter along the way – from the heaviness of the glass in your hand to the to the coldness of the the water as it enters your mouth and travels down your throat. Feel the ground beneath your feet, the chill of the air on your skin. Just exist in your body for a moment. It’s going to carry you around for the next 16 hours or so, so you might as well feel at home. We live in a fast-paced world. It’s easy to feel under pressure to stay informed and updated. But before you turn on the TV or radio to fill your brain with bad news, try listening to some mind-expanding music instead. Music can be a convenient hook to hang your mind on as you go about your morning routine. Pay attention to how your focus changes when you hear unfamiliar music, as well as tracks you already know. There should be a good mixture of both on Radio 3 Breakfast’s programme. Petroc Trelawny and Georgia Mann play beautiful music by Bach every weekday on Breakfast. Breakfast also has a longstanding tradition of playing at least one piece of music by the Baroque composer JS Bach (or one of his relatives) before 7am, Monday to Friday. Bach’s music is renowned for its meditative, equilibrium-restoring qualities – a fact recognised by regular listeners who email, text and tweet their requests for “Bach before 7” every weekday morning. Tweet from @JezzB2: Oh, joy! Wachet auf, but as you've never heard it before. @BBCRadio3 Thank you Bach before 7. The day will go with a swing now. Tweet from @gilletttyler11: @BBCRadio3 and @PetrocTrelawny thank you for this morning’s #BachBefore7 followed by the Magic Flute, perfect for a tranquil drive into work! As you get ready to leave the house, prime your mind for a day of positivity by reflecting on something you are grateful for that morning; whether it’s the weather, the existence of puppies or the music of JS Bach. This will not only improve your outlook but may also have the effect of improving your mental resilience, according to mindfulness practitioners. 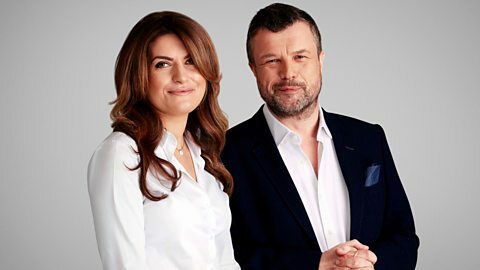 Petroc Trelawny and Georgia Mann wake the UK up each and every weekday with a selection of the finest classical music in the best performances – including a healthy dose of Bach before 7. Search for “Breakfast” on BBC Sounds to subscribe. From 6.30am every weekday and 7am on weekends. You can tweet, email or text the show at any time. Capture a moment to yourself with stress-busting classical music. Every weekend, Radio 3 Breakfast reveals the sounds of the natural world in its many guises.